So I’ve got some semipermanent office space in Indooroopilly, and thought it would be nice to be able to transparently VPN into the various machines I have running at home. The DIR-320 doesn’t have OpenVPN capabilities out-of-the-box, but you can install a custom firmware on it which will give it these features. (Yes, I know I could run the OpenVPN client on the remote machines, but having it running on the router will allow any device connected to the router to be able to see the machines I have at home, which may turn out to be useful). Decide to use DD-WRT, as opposed to the OpenWRT or Tomato firmwares. Alter your registry so that your network stack doesn’t attempt to detect DHCP on the network when a LAN cable is plugged in. (The time window to update the firmware on the DIR320 only lasts for a second or two, and if your network is doing DHCP initialisation, then you miss this window of opportunity). You can do this by running the following DisableDHCPMediaSense.reg file, or entering the value manually in regedit. Open up the Network Connections dialog, (Start -> Control Panel -> Network), right-click on your ethernet network connection and click ‘Properties’. In the TCP/IP protocol settings for your connection, set your IP address to 192.168.0.2 and remove any DNS servers (remember to write down a copy of your settings first, so you can set it back later on). Open up a command window (Start -> Run… -> cmd) and cd to the firmware folder. Type dir320-install.cmd, but don’t press Enter just yet. Connect the router to your PC (by connecting the LAN1 port on the router directly to the ethernet port on your PC), then hold down the ‘reset‘ button on the back (I used a toothpick) whilst turning it on (i.e. plugging in the power jack). If the firmware transferred successfully, then wait a few minutes and restart the router. If it didn’t, turn off the router and go back to step 9 and try the transfer again. 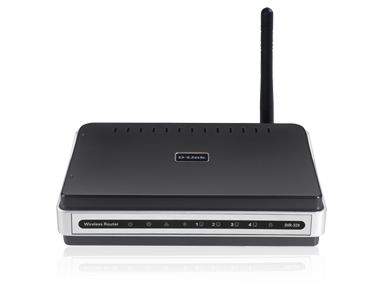 Log onto the router by pointing your browser at http://192.168.1.1, and then upgrade to the VPN Generic firmware (Administration -> Firmware Upgrade). Don’t forget to reenable DHCP by deleting the registry entry you created in step 2, and set your TCP/IP settings back to their original values from step 4, and restart your PC again.